Send warm wishes with this Sophisticated Anything for You Wreath and spread love among the people you care for. 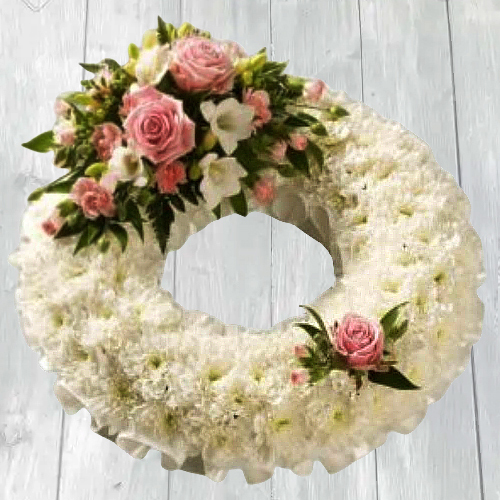 This Floral Wreath is crafted by our expert florists from the freshest White Carnation N Pink Roses with Filler Flowers. Flowers Delivery Tumkur, Send sweets Bharuch, Wedding Cake Bhusawal, Diwali Mithai Cochin, Send Flowers and Gifts to Pimpri, Online Shop Thiruvanthapuram, Flower to Akola, New Year Flowers Ghaziabad , Fresh Fruits Tatanagar, Send Gift Howrah, Dry Fruits to Virudhunagar, Birthday Delivery Thanjavur, Sending to Vishakhapatnam, Flower shop Kannur, Hanumangarh Online Cake Delivery.